The Division of Corporations of the Delaware Secretary of State maintains the record of business entities filed in the state. 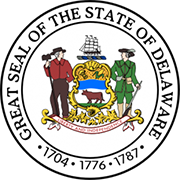 The record contains history of every company or entity that is registered under the Delaware Secretary of State. 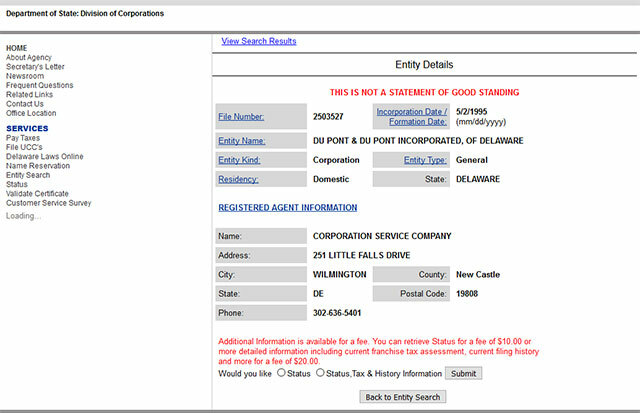 Below is a step by step guideline to find information about any business entity registered in the state of Delaware. To start your search, you will need the entity name or the file number. 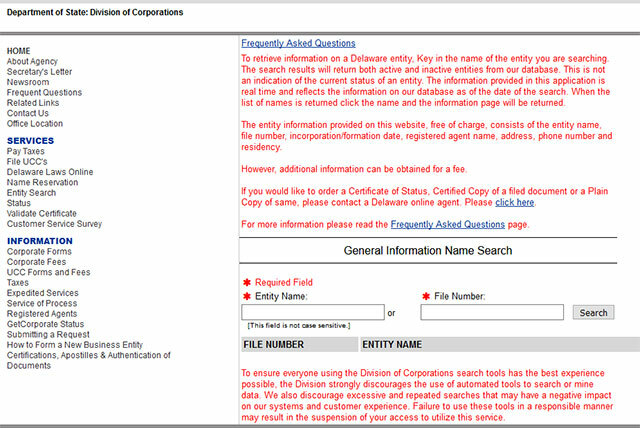 The file number is the unique identification number assigned to the business entity during the filing process. 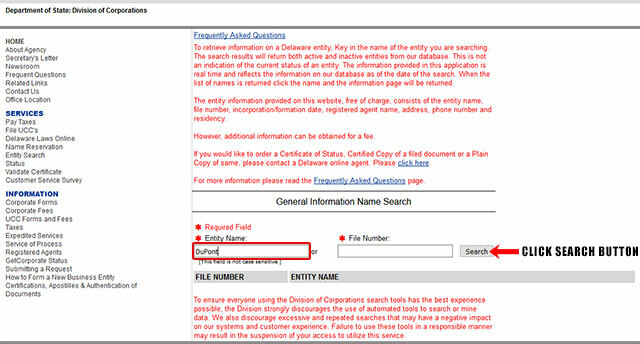 View the process below to learn how to use the Delaware Secretary of State tool. 1. To view the Delaware business entity search page, click here. (see the screenshot below for reference). 2. Type in the Entity Name in the required field. You can also fill in the File Number (this is not mandatory however). 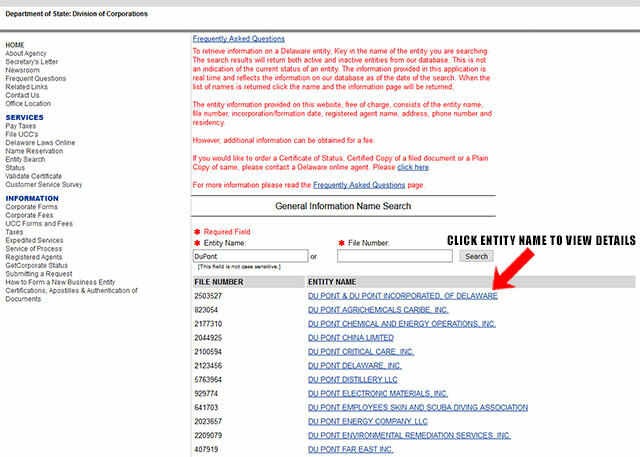 For this example, type in the name "DuPont" in the "Entity Name" field. 3. Click on the "Search" button. The Results Page will give you information regarding the entity name and file number as shown in the screenshot below. 5. The website also allows you to download the business entities annual report. (They allow you to download other important documents as well, but for a fee). The Secretary of State of Delaware heads the Department of State of Delaware which oversees several public and government services. The current Secretary of State is Jeffrey W. Bullock. The Delaware Secretary of State has a variety of responsibilities in the state, including economic development, transportation, education, culture and lifestyle issues of residents. He provides directions and frames policies for the various departments of the state. The Delaware Secretary of State is also the head of Board of Pardons and is a member of the Delaware Economic and Finance Advisory Council (DEFAC).